Starbucks Coffee Company corporate stores continue to take steps toward reducing their environmental footprint, while their “We Proudly Serve” program is lagging behind. All locations on Miami University’s campus that sell Starbucks coffee are part of the “We Proudly Serve” program, where businesses or organizations can apply to buy coffee beans directly from the Starbucks company and brew their own Starbucks products. This is different from corporate Starbucks locations. The “We Proudly Serve” locations have the flexibility to determine their own drink menu and serve their own baked goods and other food. While the “We Proudly Serve” program has many benefits, unfortunately it does not require Miami University to comply with the environmental standards of the regular corporate stores, such as the Starbucks Uptown. Starbucks is very conscious of their environmental footprint, and has taken many steps to shrink it. Cups are being made with 10% post-consumer recycled paper fiber, the lids and sleeves are recyclable, stores are becoming LEED Certified, climate change strategies are being implemented, and the stores have been rewarding customers with discounts for bringing in their own tumblers since 1985, just to name a few. Oxford’s Starbucks Uptown has likewise been working to reduce their environmental footprint with the introduction of a new reusable cup that can be purchased for just $1. These cups are made with a small quantity of lightweight material, which is why they can be sold for such an inexpensive price. 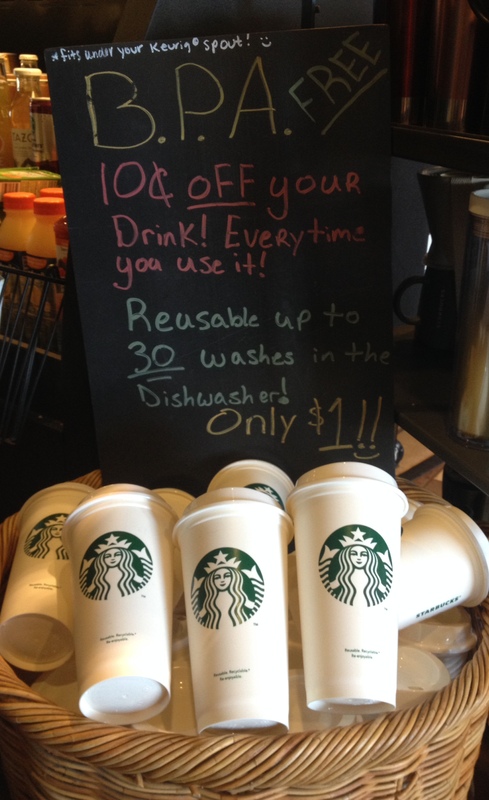 With the use of the Starbucks cup or any other reusable mug, customers receive a $0.10 discount on their drink purchase. Kastle also noted that these new cups last for approximately 30 washes, and could last even longer if hand washed. Though Starbucks cups are not recyclable, the corporate stores have implemented several reusable cup options. Sadly, these options are not a part of the “We Proudly Serve” locations here on Miami’s campus. The University is clearly trying to become more sustainable and environmentally friendly as seen in their efforts with the new Armstrong Student Center, however, the university is still far from reaching its Sustainability Goals. Implementing a reusable mug program at the on-campus Starbucks locations could be a huge step towards reducing Miami’s environmental footprint, as Starbucks coffee is so popular among students. “We will address [reusable mugs], but at this point in the year, we probably won’t get anything done. However, this is something we can look at again for fall semester” Brubacher said.